Kids are over this weekend so Valentines dinner wasn't really going to be a quiet romantic tête-à-tête. In Finland Valentines Day is about friendships, Finns are practical people and maybe found the original romantic concept of a lovers' day a bit nauseating. It's called Ystävänpäivä, which directly translates to Friend's Day. So I decided ours would be a dinner celebrating Friendships and hubbie's Birthday which officially is tomorrow. I have never done any Southern cooking. I haven't eaten much Creole food either, I do have a vague memory of eating Jambalaya in San Francisco in 1997. I have never been to the southern states of the US, so I don't pretend this to be an authentic menu you'd ever see in Louisiana, just something fun for me to try. 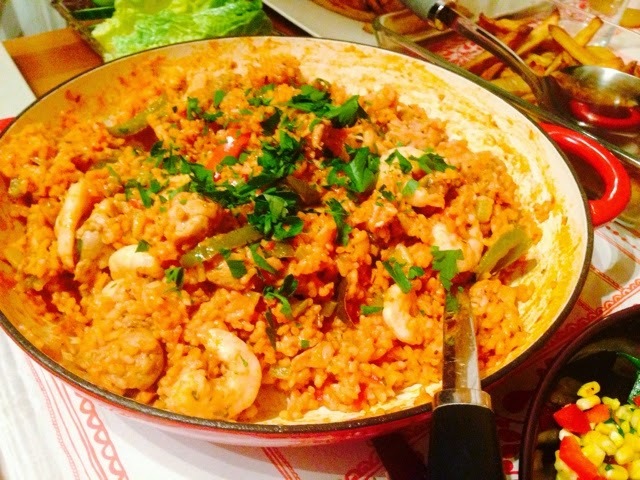 I decided Jambalaya would be a fun family meal, I have done Paella quite a few times and it usually goes down well. 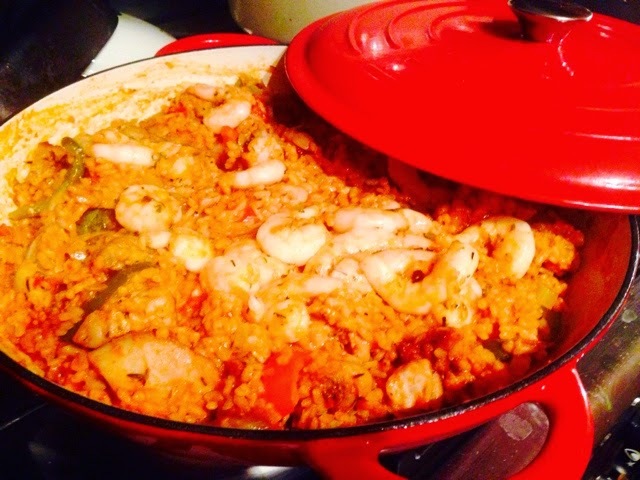 The difference isn't that great particularly as I wasn't going to be able to make the Jambalaya very spicy because my audience wasn't into spicy. 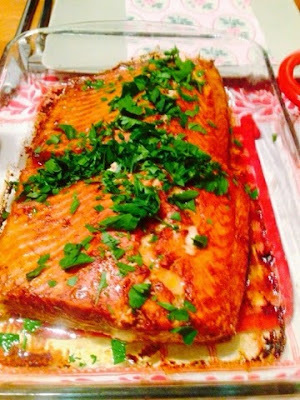 I thought some salmon might go well with the jambalaya, the kids can sometimes eat amazing amounts of food. 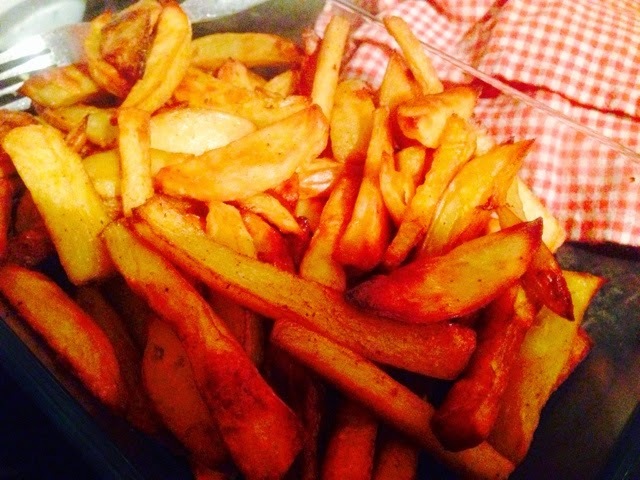 And home made oven chips and a fresh crisp salad would complete the meal. 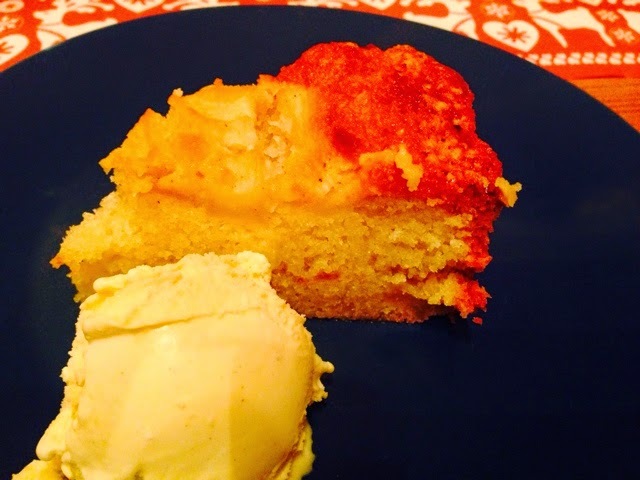 Followed by a non Cajun dessert of Brandy apple and almond cake with vanilla ice-cream. I used the Emeril Lagasse recipe, only adjusting the total amount and the cayenne pepper. Devein the shrimp, add a drizzle of oil and a teaspoon of cajun spice and toss. Place chicken pieces in a separated dish add 1 teaspoon of salt and 1 teaspoon of cajun spice and a drizzle of oil and toss. You can do this in advance so they get a chance to marinade a little, maybe an hour in the fridge. When you're ready to cook heat some oil in a non-stick frying pan and fry chicken until nicely brown on the outside. It doesn't need to be cooked through at this stage. Heat oil in a casserole dish or paella pan, fry onions for a few minutes, add sliced pepper, chopped celery and minced garlic and cook for 5 minutes. Add the tomato, rice, Worcestershire sauce, Tabasco, bay leaves water and a heaped tablespoon of Cajun spice mix. Cover and simmer for 10 minutes stirring every once in a while. Add chicken and cook for another 5 minutes, add shrimp and simmer covered for 5 minutes or until prawns have just turned pink. 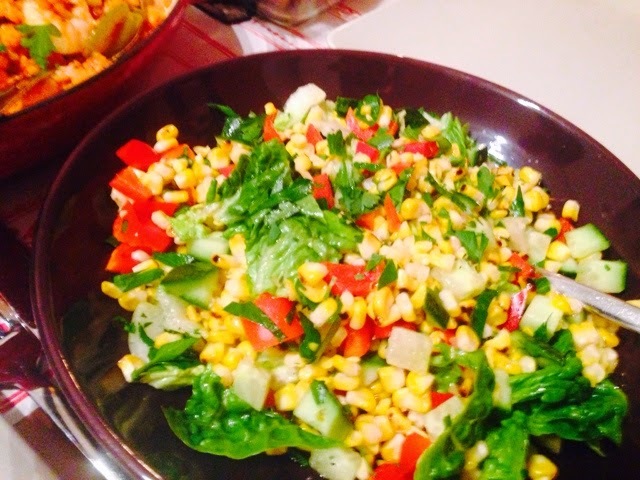 Garnish with parsley and serve with a fresh salad. Place salmon in a dish and pour marinade over, make sure salmon is covered in marinade all over and leave to marinade for 1 hour. Peel and cut the potatoes to thin chips, rinse and dry. Drizzle with oil and mix in all the spices. Oil a baking tray lighlty and tip in the potatoes in one layer. Bake in 200 C for 50 min until golden and crispy. Turn once half-way through. Grill the cobs of corn on a dry griddle pan on low to medium heat for 10-15 min, until nicely browned all over. Heat oven to 180 C. Grease a 20 cm round cake tin, line the base. Peel, core and chop the apples roughly. Melt the butter in a small frying pan, add the apples and cook stirring them over a medium heat, about 5 minutes until they are softened a little but not mushy. Add a good splash of brandy or cognac, you can flambe if you like or just stir it in and then leave to cool. For the cake whisk together the softened butter and sugar until creamy and light. Add the eggs one at a at a time. Fold in the mixed dry ingredients - flour, baking powder, almonds and cardamom little at a time. Fold in most of the apples apples. Pour the mix into the prepared tin and add the rest of the apples on top. Bake for 45 minutes or until done. Check with a toothpick and if it comes out clean the cake is done. If the top is getting too brown cover the cake with foil. 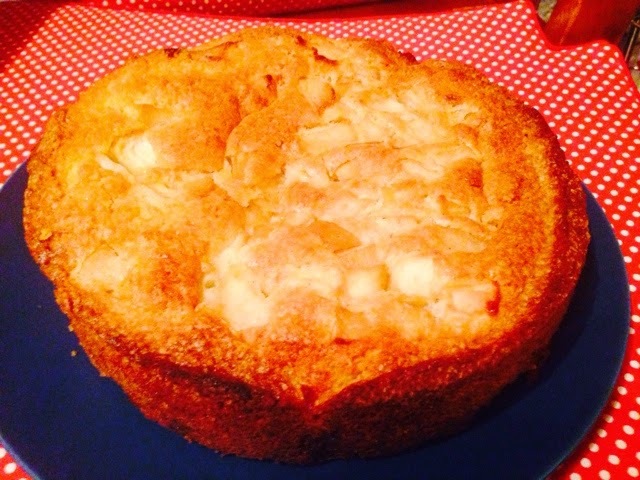 Once out of the oven, let the cake cool for 10 min and then take it out of the tin. Serve warm with vanilla ice-cream.